The net funds raised by the emission will be invested in the development of a substantial European REAL ESTATE PORTFOLIO taking into account international opportunities. This solid real estate investment constitutes the REAL SHIELD of THE STONE COIN. 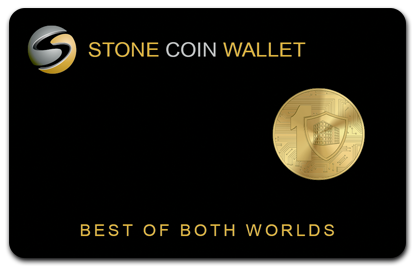 THE STONE COIN is by concept and character a payment token. This means that he can be used as means of payment at the corresponding points of acceptance and for direct transfers from wallet to wallet. THE STONE COIN AG guarantees to assure the operations of the network of acceptance points on a continuing basis. 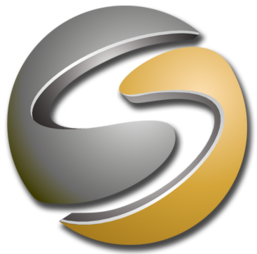 Naturally, like many other cryptocurrencies, The STONE COIN will provide through the aspired listing on relevant crypto exchanges and crypto marketplaces the option to participate in the price and market developments of the STONE COIN. The fix total amount of 1 billion tokens shall be sold as planned in five batches of 200,000,000 token each. Batch 1: PRIVATE PRE-ICO batch aims at selected international major investors, especially in Switzerland and the Middle East (planned to start in July of 2018). 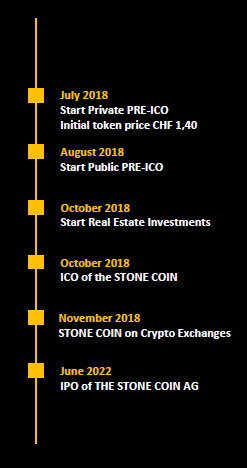 Batch 2: PUBLIC PRE-ICO batch: Token packages of at least 10,000 token are sold directly and through the webpage of THE STONE COIN AG (planned to start in August of 2018). Batch 3: ICO batch: Carrying out of the ICO by specialized service partners (planned to start in October of 2018). Batch 4 and 5: Sales-partners bais planned international sales and distribution network which is planned to distribute the batches 4+5 is currently being formed.